Naval Weapons Station Seal Beach and its Detachments at Concord, Fallbrook and San Diego each have a unique set of complementary capabilities which, when added together, provide America's armed forces with superior weapons storage, loading and maintenance services. Commissioned in 1944 at the height of World War II as the Naval Ammunition and Net Depot, the station has seen its mission evolve with modern warfare. Originally established as an activity to receive, store and load ammunition for the Fleet, the station has developed into one of the Navy's premier weapons stations. Besides readying ships of the Pacific Fleet with the missiles, torpedoes and conventional ammunition required for deployment, the station's mission has expanded to include analyzing the performance of those weapons, and using that data to extend their life expectancy and ensure reliability. Christened Naval Weapons Station in 1962, it is the only Naval Weapons Station to share its area with a National Wildlife Refuge. Approximately 1000 acres of the Seal Beach site were designated a National Wild Life Refuge in August 1972. With the aid of the US Fish and Wildlife Service, at least five endangered species live in the protected Anaheim Bay salt marsh. The refuge constitutes one of the few remaining open, undeveloped areas of Southern California today. The Naval Weapons Station is a shore activity under the command of the Naval Ordnance Center Pacific Division. NAVWPNSTA Seal Beach is located within the city of Seal Beach in northwest Orange County about six miles southeast of Long Beach and 25 miles southeast of Los Angeles. The site houses the Weapons Station and Naval Ordnance Center Pacific Division headquarters and various DOD tenants, and contains waterfront, storage and production facilities. Naval Weapons Station Seal Beach is the major Southern California ammunition storage and distribution point for the Pacific Fleet. As of late 1997 the facility employed 493 civilians in full- and part-time jobs, along with 134 military personnel. Military personnel handle most security jobs at the station, while civilians do administrative and support work. Naval Weapons Station Seal Branch was recognized as the most cost-effective weapons station in the Navy, with the lowest rate for ordnance service charged to its fleet customers. It had the foresight to reinvent itself to reduce infrastructure through reorganization and reengineering. Some 600 civilians and 150 military staff perform tasks that just a few years ago required a workforce over three times its present size. 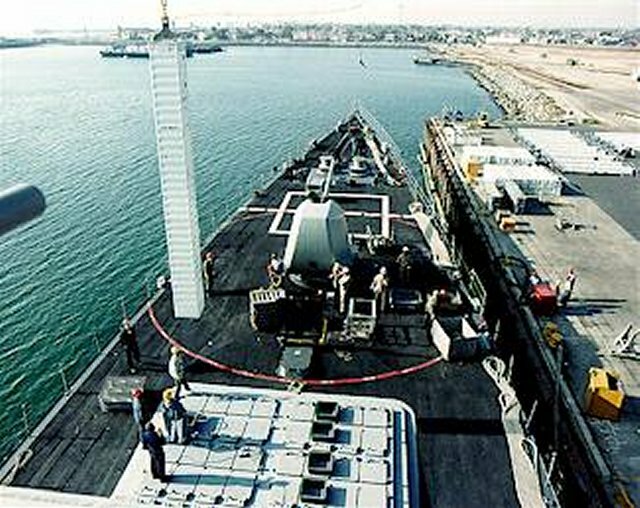 In its 2005 BRAC Recommendations, DoD recommended to close the Inland area of Naval Weapons Station Seal Beach Detachment, Concord CA, except to retain such property and facilities as would be necessary to support operations in the Tidal area of Naval Weapons Station Seal Beach Detachment Concord. 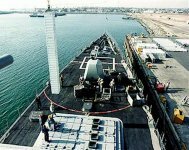 The Tidal area of Naval Weapons Station Seal Beach Detachment Concord, along with the retained portion of the Inland area, would be transferred to the Army. While Department of the Navy weapons stations had no excess capacity for loading and distribution of munitions, there was an excess of munitions storage capacity. Because of the departure of Fleet units from the San Francisco area in the 1990s, Naval Weapons Station Seal Beach Detachment Concord's Inland magazine field had been in a reduced operating status since 1999. At that time, the Inland area was retained in an effort to minimize risk should a future need develop to expand storage capacity. The Explosive Safety Quantity Distance arcs in the Inland area were available to allow safe, temporary holding of railcars with munitions destined for loading by the Army-managed Marine Ocean Terminal Concord (at the Tidal area) during high tempo operations. After consultation with Combatant Commanders, the Army Material Command and the Army component of the U.S. Transportation Command, the Department of the Navy concluded this capability would no longer be necessary. The Inland area would be excess to Department of the Navy/DoD needs and would be severable. The closure of the Inland area, therefore, would save money and would have no impact on mission capability. The City of Concord requested closure of both the Inland and Tidal portions of Naval Weapons Station Seal Beach Detachment Concord. Munitions loading requirements would preclude closing the Tidal area but the Inland area would be excess and could be closed. Because Tidal area operations would in support of the Army component of the U.S. Transportation Command, transfer of the property to the Army aligns the property holder with the property user. The total estimated one-time cost to the Department of Defense to implement this recommendation would be $14.0M. The net of all costs and savings to the Department during the implementation period would be a savings of $43.2M. Annual recurring savings to the Department after implementation would be $16.4M with a payback expected in one year. The net present value of the costs and savings to the Department over 20 years would be a savings of $199.7M. DoD estimated that this recommendation would not result in any job reductions (direct or indirect) over the 2006-2011 period in the Oakland-Fremont-Hayward, CA, Metropolitan Division economic area. Environmentally, Naval Weapons Station Seal Beach Detachment Concord, CA, was in Extreme Non-attainment for Ozone (1-Hour) but no Air Conformity Determination would be required. There would be potential impacts for cultural, archeological, or tribal resources; threatened and endangered species or critical habitat; and wetlands that might impact new construction. This recommendation indicated impacts of costs at the installation involved $0.3M for waste management and environmental compliance. In another recommendation, DoD recommended to realign Naval Weapons Station Seal Beach, CA, as follows: relocate the depot maintenance of Electronic Components (Non-Airborne), Fire Control Systems and Components, Radar, and Radio to Tobyhanna Army Depot, PA; relocate the depot maintenance of Material Handling to Marine Corps Logistics Base Albany, GA; relocate the depot maintenance of Other Components to Anniston Army Depot, AL; and relocate the depot maintenance of Tactical Missiles to Letterkenny Army Depot, PA. This recommendation would support depot maintenance function elimination at Naval Weapons Station Seal Beach and would follow the strategy of minimizing sites using maximum capacity at 1.5 shifts. This recommendation would eliminate over 243,000 square feet of depot maintenance production space with annual facility sustainment and recapitalization savings of $1.1M. Required capacity to support workloads and Core requirements for the Department of Defense (DoD) would be relocated to other DoD Centers of Industrial and Technical Excellence, thereby increasing the military value of depot maintenance performed at these sites. This recommendation would decreases the cost of depot maintenance operations across DoD by consolidation and elimination of 30 percent of duplicate overhead structures required to operate multiple depot maintenance activities. Additionally, this recommendation would support transformation of the Department's depot maintenance operations by increasing the utilization of existing capacity by up to 150 percent while maintaining capability to support future force structure. Another benefit of this recommendation would include utilization of DoD capacity to facilitate performance of interservice workload. The total estimated one time cost to the Department of Defense to implement this recommendation would be $4.1M. The net of all costs and savings to the Department during implementation period would be a savings $2.3M. Annual recurring savings to the Department after implementation would be $1.6M with payback expected in 1 year. The net present value of the costs and savings to the Department over 20 years would be a savings of $17.7M. Assuming no economic recovery, this recommendation could result in a maximum potential reduction of 85 jobs (47 direct jobs and 38 indirect jobs) over the 2006-2011 period in the Santa Ana-Anaheim-Irvine, CA Metropolitan Division (less than 0.1 percent). Environmentally, this recommendation would require spending approximately $0.1M for environmental compliance activities. DoD also recommended to realign Naval Weapons Station Seal Beach, CA, by relocating all Weapons and Armaments Research, Development & Acquisition, and Test & Evaluation, except underwater weapons and energetic materials, to Naval Air Weapons Station China Lake, CA. All actions would relocate technical facilities with lower overall quantitative Military Value (across Research, Development & Acquisition and Test & Evaluation) into the Integrated RDAT&E center and other receiver sites with greater quantitative Military Value. Consolidating the Navy's air-to-air, air-to-ground, and surface launched missile RD&A, and T&E activities at China Lake, CA, would create an efficient integrated RDAT&E center. China Lake would be able to accommodate with minor modification/addition both mission and lifecycle/ sustainment functions to create synergies between these traditionally independent communities. This recommendation would enable technical synergy, and position the Department of Defense to exploit center-of-mass scientific, technical and acquisition expertise with weapons and armament Research, Development & Acquisition that resided at 10 locations into the one Integrated RDAT&E site, one specialty site, and an energetics site. Assuming no economic recovery, this recommendation could result in a maximum potential reduction of 76 jobs (45 direct jobs and 31 indirect jobs) over the 2006-2011 period in the Santa Ana-Anaheim-Irvine, CA, Metropolitan Division (less than 0.1 percent).